Back in Germany, the first thing on my Agenda was to cycle to our organic garden. I saw the yield from the last two weeks of absence. Pictures are following coming week but I can tell you already it is amazing what the work with the moon calender and my fathers knowledge in permaculture can achieve. 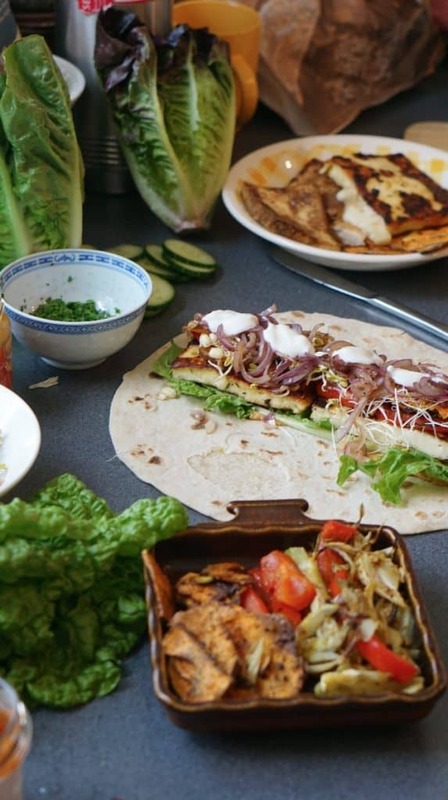 Today I have a delicious, with garden veggies filled – Halloumi wholegrain wraps recipe which is super easy to make. Furthermore, it is possible to role a few wraps in advance into the newspaper and heat them slowly up when needed. Aah it feels so good beeing back in the garden! And I am also super happy for Claire that she is back in her element of gardening and cooking – live on the big island. Of course, there is also a Vegan version included in the recipe on our website. 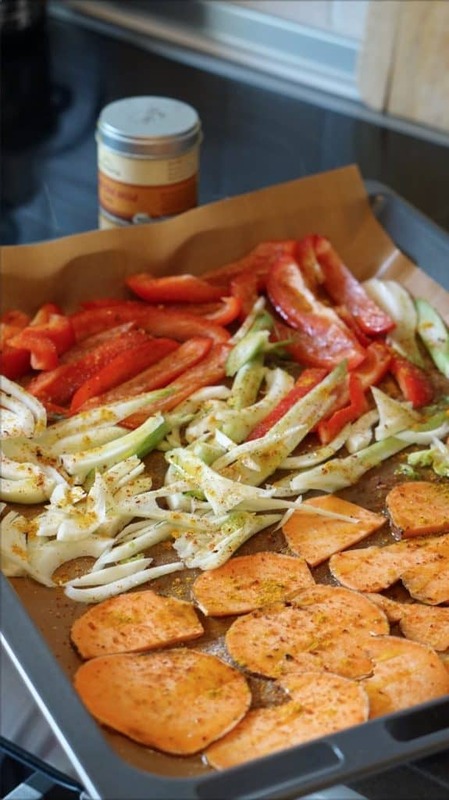 2. cut the sweet potatoes, paprika & fennel in 1/2 finger thick slices. Preheat the oven 180 degrees circulating air. 3. Grill the Halloumi cheese in a big pan in olive oil crusty brown from both sides. Put the yogurt and the ingredients with it in a small bowl, mix it up and top with some fresh garden herbs. 2. Place them on an oven sheet and drizzle with olive oil, sea salt, pepper, and curry powder. Bake the veggies for 15-20 minutes until crusty brown. 3. Grill the Halloumi cheese in a big pan in olive oil crusty brown from both sides. 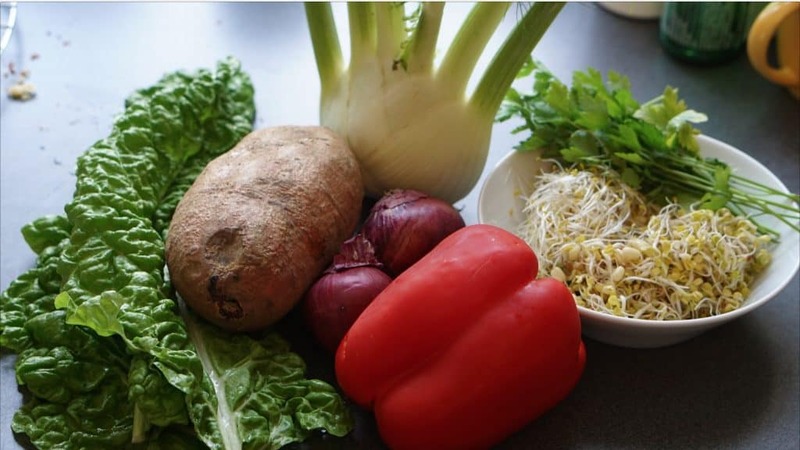 Put the yogurt and the ingredients with it in a small bowl, mix it up and top with some fresh garden herbs. 4. 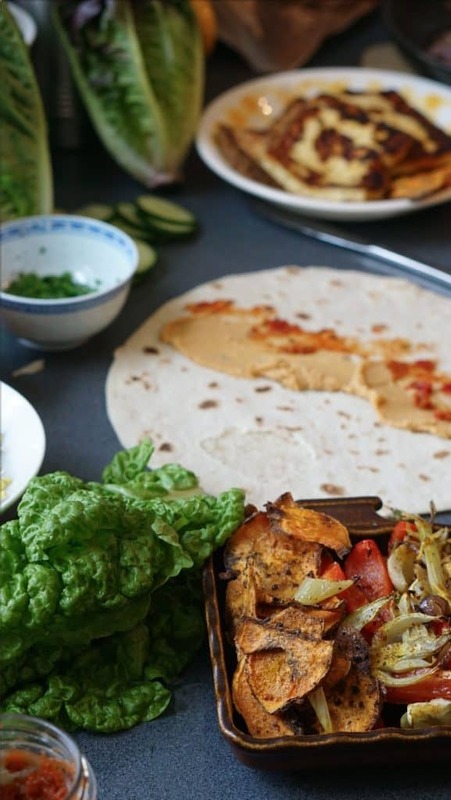 Assemble everything on a table, heat up the wholegrain flatbread shortly in the oven for max 30 seconds so that they get elastic for making the wraps (not too long otherwise the dough gets too hard and folding the wraps gets impossible). 5. 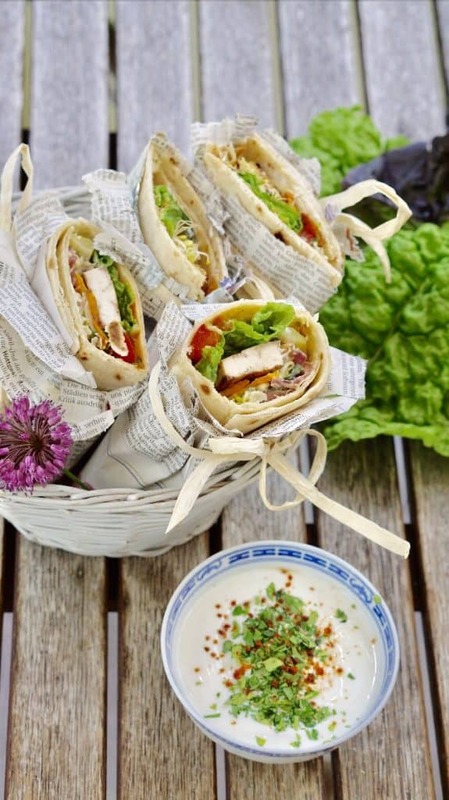 Now fill your wrap with the hummus as a base, the salad, and veggies on top and lastly the cheese. At this stage, you may also add something of the yogurt on top (but not too much otherwise it gets to soaky). Fold the wrap first downside in, then the two outer layers in the middle, so that a classical wrap optic occurs. Wrap it in some Newspaper and tie a loop around it. Whenever you are hungry now you can heat up the wrap in the oven for 5 minutes at 120 degrees and enjoy it with the dipping sauce. 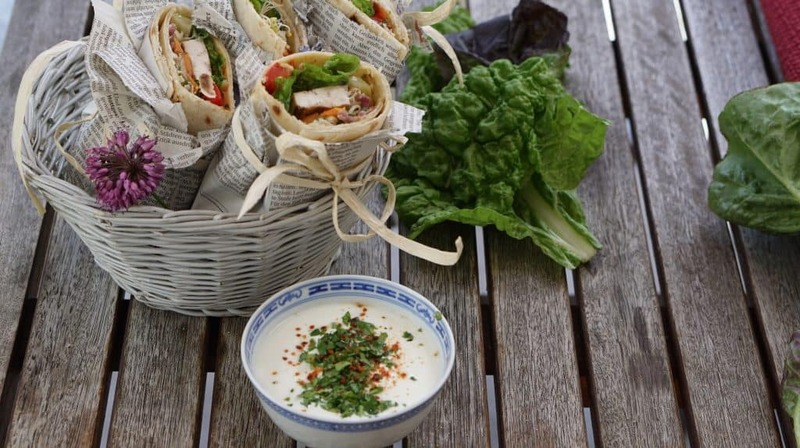 As a vegan alternative just replace the Halloumie Cheese with some Tofu with the same procedure and sprinkle some soya sauce over it while grilling in the pan. I simply could not go away your website prior to suggesting that I actually enjoyed the standard info an individual supply for your guests? Is going to be again steadily to inspect new posts.